Deutsche Post initially developed the electric StreetScooter for its own operations. 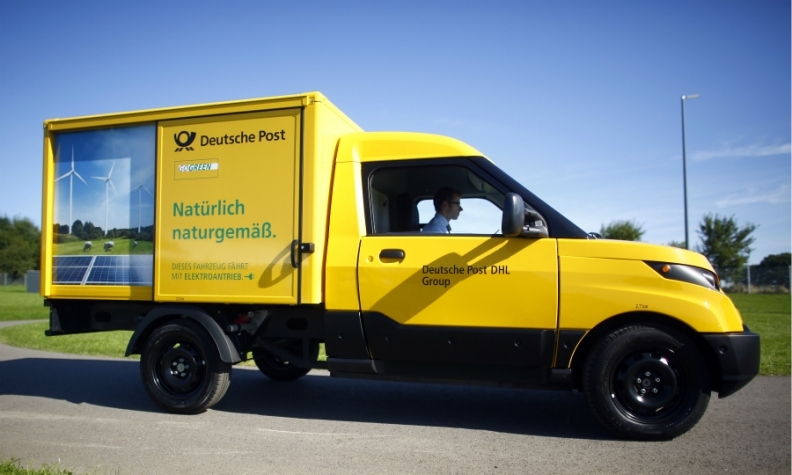 FRANKFURT/DUESSELDORF -- German postal services group Deutsche Post has hired Goldman Sachs to evaluate options for its electric van business, StreetScooter, as it seeks to expand the unit and tap an expected surge in demand, people close to the matter said. The investment bank has been asked to study potential options for Deutsche Post, which is shying away from making large investments in StreetScooter or taking on risks tied to large scale vehicle production, the people said. Potential partners, including automakers, are generally better equipped to deal with activities such as sales and marketing, product liability management and procurement of parts, they added. Private equity groups are also expected to show interest if all or part of the company is put up for sale, they said, adding that a stock market flotation also remained an option. Deutsche Post CEO Frank Appel has said in the past that he would expect large interest from German and foreign groups, be it peers or investors, noting that analysts have valued StreetScooter at several billion euros. Deutsche Post and Goldman Sachs declined to comment. Deutsche Post initially developed the StreetScooter for its own use, but due to demand from rivals looking to reduce emissions, it has boosted production and is selling to third parties. It put the StreetScooter business into a new unit in April and Appel has said options for the unit included an initial public offering, a sale or a partnership. However, he also said that Deutsche Post would run StreetScooter, which Deutsche Post fully acquired in 2014, for at least two years. Deutsche Post operates about 6,000 electric vehicles and in May opened a second StreetScooter production site. The company views its e-vans as an advantage in its day-to-day business of delivering parcels as German cities are becoming increasingly sensitive to air pollution. StreetScooter already cooperates with Ford and has developed its StreetScooter Work XL model together with the automaker.